The thought of moving is enough to strike fear in the hearts of the bravest souls. Relocating on-the-cheap (without the benefit of a team of professional movers, a sea of boxes and bubble-wrap, and a small fleet of vans), well, that’s just plain hard. For most of us, high-end moving services aren’t part of our reality and moving still involves straining the bonds of friendship, frustrated all-night packing marathons, and eating croutons and bacon bits for lunch because we’ve packed the rest of the food. With some simple preparation, a laser-like focus, and lots of patience, moving on a budget can be less of a hassle. Here are eight tips for successful DIY moving. Over the years, we become unconsciously married to our household items. Either through sentimentality or just plain habit, we tend to hold onto everything without a critical look at what needs replacing, no longer fits our lifestyle, or doesn't suit our taste. Moving is a perfect time for a serious review of the "stuff" in our lives. Take a look at everything big and small. What can be purged through charitable donation? What can be sold on eBay or Craigslist? What should just be tossed in the recycling bin? The more you reduce your load before the move, the less organization, packing, and unloading required later. Making a few bucks on unwanted items before moving can also help ease the budget burden during the move. Once you’ve pared down, it’s time to get organized. During a big move, I keep a calendar of what needs to be done day-by-day in order to be out of the old place and into the new place on-time and with my sanity relatively intact. Weekdays are for logistics — calling the new utility companies, handling address changes, getting quotes on van rentals or storage facilities, etc. Evenings and weekends are reserved for collecting boxes, cleaning, and packing. Two or three tasks accomplished each day helps keep a move manageable without putting the rest of your life on hold. Never underestimate the number of boxes you’ll need for a move, and (trust me on this) it’s always better to have too many that too few. I’ve never embraced the idea of paying for cardboard boxes, so I hit the grocery stores, dollar stores, and warehouse clubs continuously in the weeks preceding a move. Most places will happily give you as many as you can carry; it saves them the expense of crushing and disposal. Keep in mind, larger grocery stores restock their shelves during off-hours, so late evenings are your best bet for finding fields of boxes just waiting to be recycled. While you’re at it, keep an eye out for newspaper and bubble wrap that may also be headed to the recycling bin. 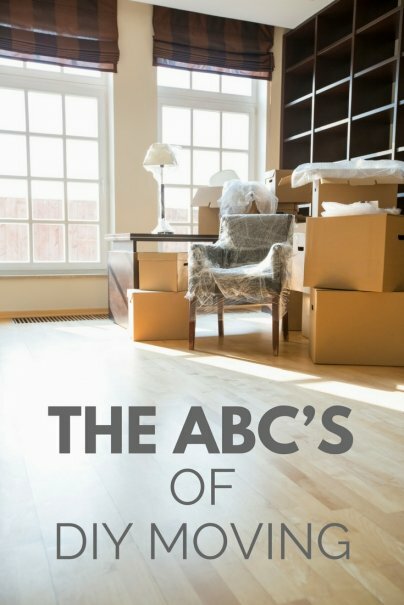 Consistent, easy-to-read, and accurate labeling of boxes can make all the difference if you need to unpack over time or divide your move between a storage space and new home. I use bright paper and bold black markers to clearly label (in two or three words) what’s in each box. Remember, labels always go on the sides of the boxes — top labels just get covered up when boxes are stacked. Labor is always at a premium during a move. Putting the word out to good-hearted friends and family weeks in advance can help get more "yeses" and keep things congenial and on-track during the move. Scheduling and rotating your team of helpers can help avoid frustration, exhaustion, and taxed friendships. Strong coffee (or the adult beverage of your choice), snacks, and frequent breaks keep everyone motivated and help show consideration. For a move of any significant size, a moving van or truck rental is probably required. Local and national options are usually available, but keep in mind that additional charges might be lurking in those advertised low prices. Daily moving rates seldom include mileage or extras like moving pads. Watch out for the nickel-and-dime fees and remember to refuel before your return or get stuck with an astronomical price-per-gallon charge. The past few years have seen a boom in the storage industry. Our society is in transition, financially struggling, and on-the-move. Before you rent a storage space, be sure to shop around, get a few different quotes, and check each place out with a critical eye. First, look for water damage; it might suggest the building isn’t weather tight or well-insulated. Keep an eye out for rodent droppings, gnawed wood, or other signs of an infestation problem. Look for ways to breach security within your space — are the units divided by solid walls, or just chain link fence? Though you’ll probably supply your own padlock, is the locking mechanism and latch in good shape and solid? Is the facility remote and poorly lit, or bright and well-monitored? The chaos that moving creates affects all aspects of our lives. One small way to battle the disruption is to pre-pack the essentials. Approach this day-to-day bag as you would if you were traveling — what will you need every day during your move that might otherwise inadvertently get packed away? Medication, extra clothes, toiletries, computer essentials, unpaid bills, checkbooks, and work supplies should all be considered. The last thing you want to do is survey a wall of boxes at 6:00 a.m. while trying to figure out where your employee security badge is. Even the best moving plan can’t account for every contingency. Moving is disruptive, chaotic, and stressful. These tips can only help prevent some of the more common logistical and financial pitfalls from the getting the best of us. Worst case scenario: Two stacked computer paper boxes make a great coffee table, and croutons and bacon bits eventually start to taste like a ham sandwich. Happy moving! Also, keep box sizes manageable. When I moved from a first floor to a third, didn't take into account how much more work it would be lugging those big boxes up. Moving out was fairly easy, moving in was exhausting and awful. Best boxes for light items: Copy paper boxes. They have lids and stack nicely. Best boxes for heavier items: Apple boxes, from the produce section at your local market. They're really sturdy.